Keep cool with our Summer Cooling Special! Purchase a greenhouse and receive one free automatic 24" x 24" side vent for every two roof vents that comes with your greenhouse or home attached lean-to. An additional side vent helps cool your greenhouse by allowing the lower cooler outside air to enter the greenhouse as the hot air inside rises and exits through the roof vents. Improves greenhouse convective cooling by 20%. Includes a solar powered automatic vent opener that opens when it is hot and closes when it is cool. The Summer Cooling Special is in effect for purchases made between June 15th and August 15th. This offer does not apply to the Sun Garden Feature Greenhouse or any of the Juliana Greenhouses. 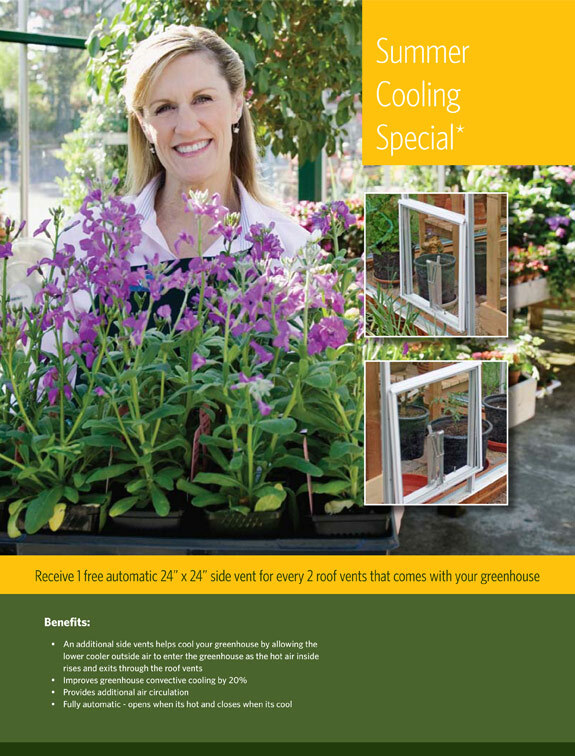 Order today and keep your greenhouse cooler!